Today was the kids' last day of Winter Break from school, so we decided to take them to the rec center this morning to go swimming. I told Jerry he could watch them in the pool while I did a run on the indoor track, and then I'd watch them in the pool while he did whatever he wanted to do. I brought my bathing suit because the kids really wanted me to swim with them. I hate swimming. I don't like being wet, I don't like how disgusting my hair feels from the chlorine, I don't like having to wash a ton of towels and stuff when we get home... but I agreed to swim with them. 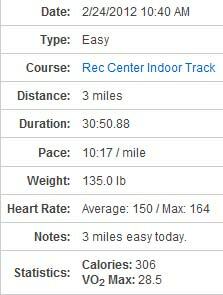 First, I did my easy three-mile on the indoor track. It was kind of boring for the first mile, because nobody else was on the track. But then some guy came in and started lapping me. He was probably running a 6:30 mile, but he quit after about a mile. Right when I was finishing my run, I walked over to my water bottle and saw this guy that I went to high school with. I started going to that school in tenth grade, and he was my first crush at that school. I even asked him out to the Sadie Hawkins dance (the only time I've EVER asked someone out!) and he said no. Hahaha, he didn't give me the time of day! I wish I could say that I looked really awesome today and he was checking me out and all that, but no--I had just run 3 miles, my hair was in a bun and I had no make-up on. My shirt was a little sweaty, and it happened to be my horribly embarrassing "Half My Size" shirt. I don't know if he recognized me, but I avoided looking at him while I stretched and then I went downstairs. I went into the women's locker room and undressed to put on my bathing suit. It's way too big (a size 12 suit) and I knew I looked ridiculous. But I hate wearing bathing suits, so I avoid shopping for them. I hoped that I'd be less self-conscious of my body now that I've had the skin removal surgery, but I was actually MORE self-conscious. I was very aware of my saggy thighs and upper arms. The bathing suit was really baggy, so I kept pulling at it make sure it was in place. I was the very definition of 'awkward'. I was relieved to actually get in the water so I could hide myself. I swam with the kids for about a half hour, the whole time dreaming about getting in the sauna to warm up when I was done. I brought shampoo with me to get the chlorine out of my hair, so I washed my hair and then happily skipped over to the sauna. I was so looking forward to feeling that hot, steamy air hit me in the face when I opened the door. When I opened the door, it was just as cold as the air outside. It wasn't turned on :( So I just hurried and changed into my clothes and we left. Next time I'll need to remember to turn on the sauna before I get in the pool, so it's nice and hot. I sneaked a peek at the scale this morning, and my weight is going back down since I quit the challenge--hallelujah! In the three days since I quit, I've dropped 5.5 pounds. I started the challenge at 136, got up to 144.5 in the three weeks that I was doing the challenge, and then today I was 139. I think quitting the challenge early was definitely the right decision! Wow, how great is that? Eating how you want to lets you lose the weight instead of eating to a strict set of rules. I guess it's all learning. body issues' even though you've lost all that weight. I wonder if girls like us will ever not judge ourselves harshly! I am just amazed at your achievements giving me the desire to do the same - for my health sake - and like you wanting to play with my children without getting puffed out and exhuasted. Just a tip: Before your next swim soak your hair with water first, from the sink or the locker room shower. That way your hair absorbs clean water and will absorb less pool water. Haha I feel the exact same way about bathing suits and swimming. I usually put my hair up and warn my family not to even *think* about getting my hair wet lol. The last time my husband and I went out of town, we went to the hotels pool/hot tub. I was wearing my 65 pounds ago bathing suit. Luckily I still had my "omg I'm so fat I need a cover up" on, because my bathing suit repeatedly attempted to come off. I was thinking about bathIng suit shopping online this year! Glad your weight is dropping again, must feel great!! Ugh, just the thought of getting in a pool gives me the heebie jeebies. Swimsuit season, blech. Glad to hear the scale is going back down for ya! YAY! I don't mind swimming - outside, in a clean pool, on a HOT day. But I laughed when reading that you don't like being wet. I hate going to the indoor water park because you are half wet the whole time and walking around and it just feels icky. That doesn't even take the chub factor into account. :) I hate shopping for bathing suits, bras, or jeans!! PS And you totally have the same kind of luck as me - to run into a former crush when you look less than your best. LOL. It's really crazy how much that challenge affected your weight. I think you made a good choice to stop it! wow I would have quit the challenge too! It just goes to show that thinking you're eating healthier doesn't really mean you are! Sounds like it was a bit of a rough morning. I don't like swimming with the kids for all the reasons you mentioned. Minus the surgery. I am sorry you had a rough time but you are fabulous! Definitely the right decision to quit the challenge then. Who knew that REAL food wasn't necessarily LOW CALORIE food? I guess we all knew, but still you'd think eating healthy would result in good things--guess not. Good to know--I won't try that now, not that I was tempted. I'm too weak to restrict myself from processed food--which I love. Bet that was a weird feeling to run into your old crush. I wore sweats out today (I never do that--but I was lazy) when I took my granddaughter back home, and stopped at Target. I have gotten so I WANT to run into people I haven't seen in a while now, but today, in my sweats, I didn't want to. I figured THIS would be the day I would see somebody I knew. My hair was also a disaster, and no makeup of course. I was lucky and didn't see anybody though. Thank goodness.